Lotus Root is a popular vegetable found in southern and eastern Asia. You can find fresh or frozen Lotus Root in Indian or Chinese markets. It is also available in Farmer Markets like Sprouts or Whole Foods. Rich in dietary fiber, vitamin C, potassium, Vitamin B6, lotus root does have a texture that is slightly crunchy, and mildly sweet. When used in stews, soups, fritters and curries; lotus root can provide very earthy flavor and texture. 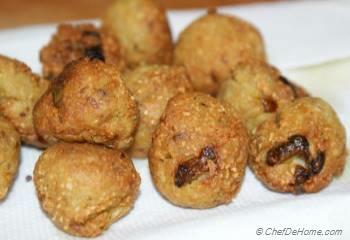 I have made very simple and tasty Lotus Root fritters here. 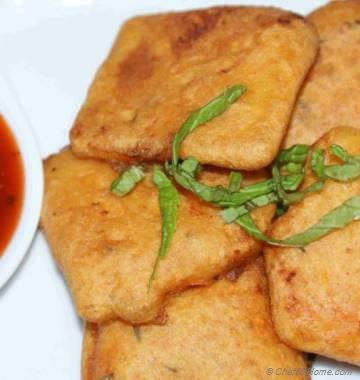 These fritters taste best with tomato or cilantro based sauce or chutney. 1. Peel lotus roots and cut in 1-2 inch size depending upon size of your chopper. Chop lotus root to break it to very small (barley grain) size chunks. You can add 1 -2 tsp water or oil to help in grinding process. Now add lotus root and all ingredients listed above in a bowl and mix well to make a thick batter. Add little water at time to make thick batter. 2. 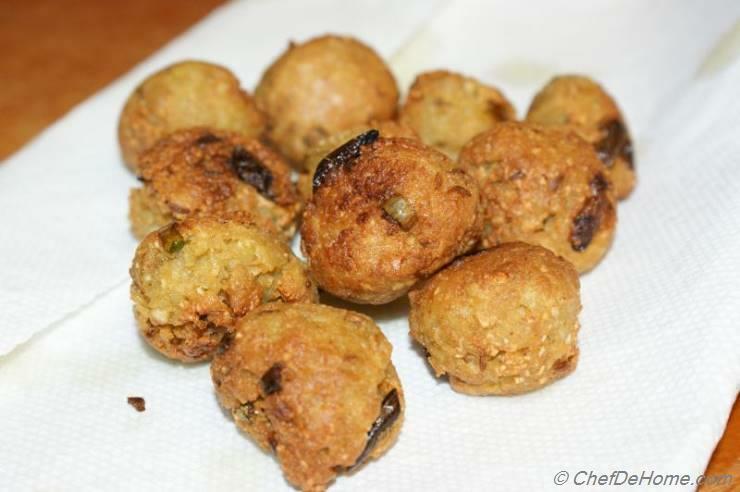 Heat oil at 350 F, make small 1 inch balls of lotus root batter and deep fry for 5-7 minutes or till fritters are golden and crispy. 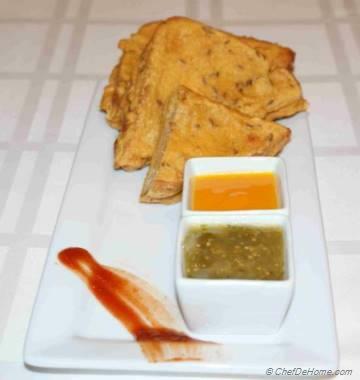 Hi ChefDeHome, do you know where can I get chickpea flour? 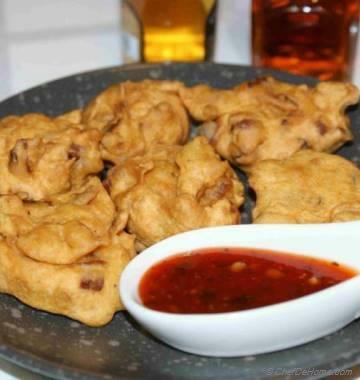 @Ginger, Lotus Root fritters is a versatile recipe. 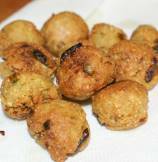 You can also add these fritters to any kind of Thai Or Indian curry based gravies. Loving it. I have never made fritters with lotus root. Can't wait to try this recipe.